Volunteers at Milton Keynes celebrate a job well done. 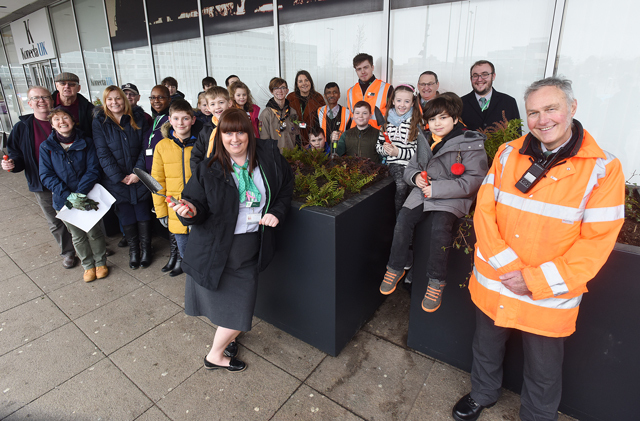 Local children have come together with community volunteers and railway staff, to fill new planters outside Milton Keynes station. Great Linford Scouts were joined by Milton Keynes Model Railway Society and London Northwestern Railway staff on Saturday (26 January), to put the display together outside the main station entrance. The planters have been installed as part of ongoing work to improve the station environment and facilities. Russell Horne, chairman of Great Linford Scout Group, said: “This was a great opportunity for the group to get involved with other organisations outside Scouting. As Scouts, we believe in preparing young people with skills for life, such as teamwork, leadership and resilience. These skills have helped Scouts become everything from teachers and social workers to astronauts and Olympians. We help young people develop and improve key life skills”. London Northwestern Railway has 26 station adoption groups across it’s network. These groups are made up of volunteers involved in a range of activities, from maintaining planters, installing artwork and undertaking community engagement activities using space available at the stations. As well as improving the experience for passengers, this community engagement has also been recognised in helping to combat loneliness for those who take part. The train operator is looking to double to number of station adopters across it’s network from around 150 to over 300 over the next year.